We recently wrote about beta-AIBA, a new slimming supplement that manufacturers prefer to call BAIBA. Its structural formula is shown here. BAIBA works in a completely different way to other substances found in slimming supplements, we wrote last time. Today we’re going to annoy you with an animal study that researchers at the French Inserm published in 2008 in Obesity. That study suggests that BAIBA is not only effective, but also exceptionally safe. The researchers used mice genetically manipulated to gain weight easily [ob/+] for their experiment. The mice’s genes for leptin didn’t work optimally. Leptin is a hormone produced by fat cells, and which regulates metabolism. If you’re healthy you make more leptin the faster your fat cells grow. As a result you burn more calories. The mice were given food containing extra fat and sugar for four months. Some of the lab mice were also given BAIBA via their drinking water. The human equivalent of the dose tested, for an adult weighing 85 kg, would be 850 mg per day. The researchers used a group of mice that had not been genetically modified [+/+] as a control group. These mice were given the same calorie-rich fattening food, but got no BAIBA. Administering BAIBA reduced the increase in body fat by 40 percent in the ob/+ mice. During the experiment the lean body mass of this group decreased a little, but BAIBA supplementation reduced the amount of the decrease. BAIBA had no effect on the mice’s food intake. BAIBA supplementation led to an increase in the amount of leptin secreted into the blood, fat tissue and stomach of the mice. After four months the researchers gave the mice a hefty dose of glucose. In the animals that had been given BAIBA the glucose disappeared more quickly from the bloodstream and their insulin level did not rise as high. BAIBA had no negative effects on the blood cholesterol concentration and didn’t reduce the antioxidant status either. 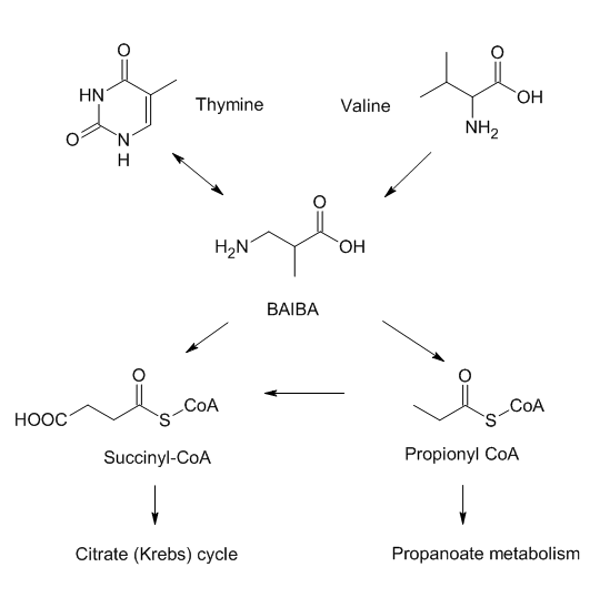 BAIBA did reduce the concentration of the enzymes LDH and ALT in the ob/+ mice. That’s a positive effect, and would suggest that BAIBA made at least the liver of the ob/+ mice healthier. When the researchers studied the mice’s liver tissue under the microscope, they saw that BAIBA was responsible for less fattening of the liver, less inflammation and less fibrosis. Obesity (Silver Spring). 2008 Sep;16(9):2053-67.